The Salsa Box is a tiny portable home designed for people who value simplicity. It was created by Shelter Wise, a small company based in Portland, Oregon that specializes in tiny homes, accessory dwelling units (ADU’s), and energy-efficient buildings. 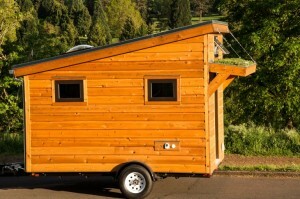 The tiny house measures 7’4” x 12’2”. It is also available in larger versions that are 16 feet, 18 feet, or 20 feet long. The simple construction process is designed to save weight, energy, and space. The first Salsa Box was completed in April 2014. It was built as a model to help students at a workshop learn how to build their own tiny houses. The living area includes a table for eating, a sitting area, bookshelves, and storage space for clothing. The Salsa Box includes a queen-sized bed, electrical hookup, flushing toilet, electric hot water heater, combined shower and mini tub, kitchenette area, and Living Roof above the porch. The house comes with basic amenities such as linens, kitchen supplies, and books, art, and games related to Portland, the home of Shelter Wise. 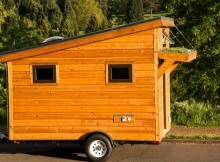 The Salsa Box can be modified so that its occupants can live completely off-grid. It can utilize a compost toilet, solar power, and a water catchment system on the roof. The Salsa Box is built with wood certified by the Forest Stewardship Council, an international non-profit organization that promotes responsible management of forests around the world. The tiny home has a metal roof and energy-efficient low-emissivity windows that provide better insulation than standard windows. The Salsa Box can be transported on a 5,000-pound-rated, single-axle trailer. Since it can be transported on a standard trailer, a permit is not required. The design can also be modified so that the tiny house can rest on a foundation.